A Space traveler in 1600s Japan. Imagine the possibilities! Exiled from his home planet by a war he can’t win Captain Kendrick has to run as fast and as far away as possible until his interstellar fighter craft runs out of fuel. He lands on a large island in the northern hemisphere on a blue marble planet not unlike home. It’s Earth, 1600s Japan where he befriends the local shukido (protector), helps them defend against invaders, introduces them to modern technology such as explosive powder and a powerful compound bow. He earns the name “Boomsan”. He introduces new concepts to the leader of the local village, ship builder Duroyko Honashi, and falls for his independent daughter Doiyoko. When the Empire seeks out Kendrick his new friends help to defend against them. They learn many things from him, but not as many as he learns from their simple and honorable ways. The adventure has just begun. I suppose being schizophrenic would help. We’re not schizo, honest we’re not. I can put myself in different frames of mind, but I only write when the muse strikes. It’s there, the ideas flow, I write. The ideas go away, I stop writing until the muse strikes again. I don’t use any specific technique, such as an outline, or write the end and then the rest of the book. I just write, edit, proof, reedit, reproof, an infinitum. W r i t e i t d o w n ! Don’t worry about grammar or being correct and proper. Get it outta’ your head first. Get it on paper (or computer screen). You won’t have anything to edit and correct if you don’t write it down first. That’s of primary importance. He currently resides in Reno, Nevada with three computers, a bicycle, and a 10 year old SUV (no, that does not stand for Small Ugly Vehicle, it’s a Mercedes). I’ve been a SciFi fan since I was old enough to read. 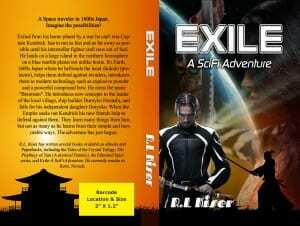 I started writing SciFi at age 14. I wish I had those writings now (long since gone). I found myself with oodles of time on my hands. I’m also a big fan of sword & sorcery fantasy. Here’s the strange part. An author named Robert Aspirin (Myth Conceptions, Another Fine Myth) sponsored a few young authors and published their works under his guidance. I was inspired to take up writing again, so I wrote a Western. (insert double take here). He wrote fantasy, I wrote a western. Dunno why a western, I don’t even read them. It just came to me. I concentrate on good character development and an interesting story. It worked. I wrote another, working on the third. In the meantime I wrote 4 S&W fantasies, Tales of the Crystal trilogy and one stand alone.